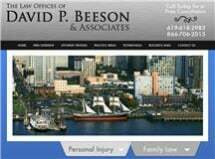 Since 1978, the law offices of David P. Beeson & Associates have helped thousands of clients facing difficult challenges during divorce or following car and truck accident, dog bites and other serious injuries. We offer the highest level of service and attention to each client possible, no matter what the legal issue. We practice out of an 1890's home, not a glass and chrome office building. When you walk into our sitting room, we treat you like our most important client, because you are. We handle all injury case and family law matter including but not limited to; car accidents, truck accidents, SUV rollover accidents, dog bites, slip and fall, sexual harassment lawsuits, and injuries to children.